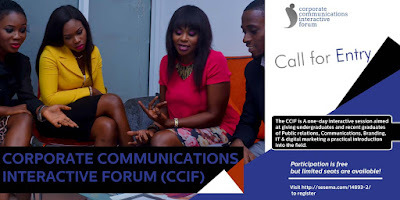 Integrated marketing communication firm, Sesema PR has introduced a one-day interactive session, Corporate Communications Interactive Forum (CCIF) to give undergraduates and recent graduates of Public relations, Communications, Branding, IT & Digital marketing a practical introduction into the field. The CCIF will provide a platform for learning and networking with industry professionals. 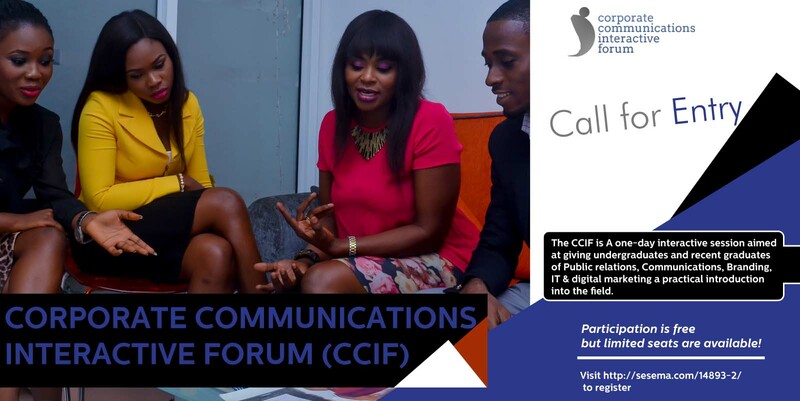 The objectives of the CCIF are to introduce new entrants of Public relations and brand management to the rudiments of the sector. To educate young people on career decisions in corporate communications and to revive interest in the PR industry, amongst students and graduates. Also to help bridge the divide between practice and academia as well as prepare participants for corporate communications career and give them the opportunity to be part of the CCIF network. Interesting gifts will also be won by participants. Deadline for registration is 19th of September 2016. Shortlisted participants will be notified on 21st of September 2016. Follow our social media handles @sesema_pr , @theinsider_ng on twitter and The newsinsider on IG for more details about the event.